Ask fellow campers about "Birds Hill Provincial Park" and nearby attractions. Nice park but seems like they try to squish us into the tightest sites despite having larger open sites. Our slideout ended up protruding into the driving lane, so I worried all night. We camped at Birds Hill Provincial Park in a Motorhome. 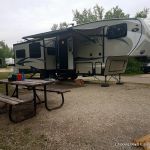 September 4 - Birds Hill Provincial Park, Winnipeg, Manitoba, Canada $32 with electric, full hookups and unserviced loops, site Chipping Bay Loop 9, over 700 sites, beaches, bike trails, dump station, hikes, group sites This park and campground are huge. There are over 700 sites located in many loops with a variety of options. One big shower bathhouse right next to the store $1.00 for 3 minutes. Our site was a pull through right along the loop and our loop was near everything. Great bike and walking trails which lead to picnic area, beaches, hikes, etc. This is one of the most popular parks in Manitoba and we stopped for a night on Labor Day. The dump station had those trying to leave the park backed up for some time but again this had been a three day holiday weekend. Check in is at 4 and check out at 3. You can check in anytime and they seemed to ignore check out time. The girl at the desk at the entrance was very nice and informative. The park has rolling hills, prairies, wet meadows, bogs, and aspen forests. There are horse stables for those who like to ride and some great bike trails. In the summer, the park has the Winnipeg Folk Festival here. That is one of the biggest festivals in North America. There is a lot of activity in this park all through the summer. This was a good overnight stay. We camped at Birds Hill Provincial Park in a Motorhome. This is a very large park with lots of green space. The beach is huge (west and east beach are connected and run a very long stretch of beach) Great for families or anyone really. Great hiking and biking trails. Nice amenities. We camped in Tree Bay which was an interesting set-up. Everyone camped around a circle and just pulled over to the side with very private camping areas just outside your door. We did have problems with our sewer being backed up, but the park employees were very nice, very responsive and came out right away and got us taken care of in no time. No wi-fi in the park but I was able to access decent wi-fi on my cell phone. About a 30 minute drive to Winnipeg. We would camp here again and will look for other Provincial parks as well based on our experience at this one. We camped at Birds Hill Provincial Park in a Fifth Wheel. We are here NOW .... Meadowlark 8 - Electric 30 amp, no other services (water taps about 150 feet away). OK Prov campground ... close to Winnipeg, get about 4 english and 1 french over the air TV stations. OK store within walking distance. Park police make frequent drive by's to assure peace and calm. No complaints. We camped at Birds Hill Provincial Park in a Fifth Wheel. Firewood is $9.00 a bundle (dry but poorly split - bring a big axe). If you can bring your own firewood $$$. Town of Birds Hill is close, Wpg 20 min. Bird's Hill Provincial Park is huge. There is a lot to do, including a really good swimming beach. We stayed just two nights. The beach and playground are great for kids. We stayed in Savannah Bay area of the park. The campsites are slightly odd - since all utilities are located at a corner of the site with is basically at the end of your unit. It may be difficult to connect. Make sure you have extra hose for either water or sewer. The sites are gravel, but fairly private. They are all pull through sites. Buses and small trees keep things fairly private. In addition to paying for you campsite, you must also buy a pass for the park. That strikes my as somewhat odd, but such is life. You can't buy the park pass when you make and pay for the reservation. The utilities were strong, though I don't think the water tasted very good. Cell service was just fine. There are a couple broadcast TV channels available from Winnipeg. The location is within 30 minutes of central Winnipeg, so I think that's pretty good. I would stay here again. We camped at Birds Hill Provincial Park in a Travel Trailer. The Museum of Manitoba is really terrific. We stayed in a full service site. The picnic table and firepit are situated in a private area adjacent to your campsite. The park is quiet and very clean. There are lots of opportunities for biking and hiking. We would stay there again. 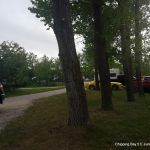 We camped at Birds Hill Provincial Park in a Fifth Wheel. There is a store in the park. Very nice Campground, quite place, lots of nature, animals. Sites are with lots of trees, table and fire pit (away from the streets, so it gives you more privacy). We did not use any of the facilities, some sites were pretty narrow to circle in. We first got a site that was almost impossible to bring our small 5th wheel in. Was no problem to change, office is close and people very friendly. We would stay here again. We camped at Birds Hill Provincial Park in a Fifth Wheel. A nice park with private sites and friendly staff. They were busy paving some roads so it should be even better next year. A superb restaurant is adjacent to the park (Pine Ridge Hollow) that was not too expensive. We camped at Birds Hill Provincial Park in a Fifth Wheel. 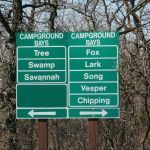 This campground is located about ten minutes outside of Winnipeg in a Provincial Park. The park itself has lots of hiking trails, a paved bicycle trail, beach, riding stables. You need to drive to most of the activities, except the hiking trails. We live in Winnipeg, so this a just a 15 minute drive from home for us; but once you are set up you feel as if you are hundreds of miles away. Sites are very large and private. We stayed in a pull through, which was different than most of the drive throughs we have stayed in. With these, you park alongside your spot and sort of have a private yard on the side of your unit. There is a small store on site to pick up necessities, but for anything more you would have to travel back to Winnipeg. But RV dealers/stores as well as restaurants and shopping are all only 15 minutes away. However, there is no wifi or cable TV, so it is a real "camping" experience. We camp here regularly when we feel the need to "get away" for a weekend. We camped at Birds Hill Provincial Park in a Travel Trailer. This campground felt very private. I would stay here again. We camped at Birds Hill Provincial Park in a Motorhome. 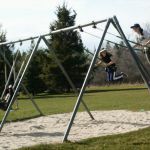 Are you affiliated with Birds Hill Provincial Park ?